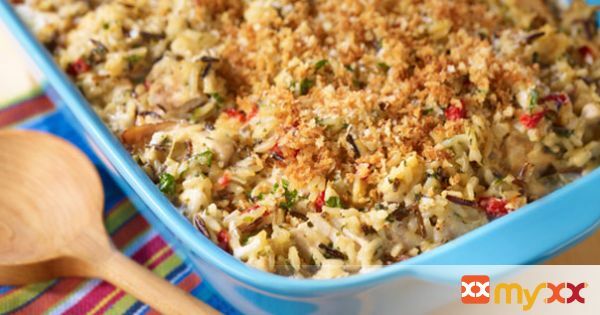 A tasty, mouth-watering rice and chicken casserole. 2. Cook rice and contents of seasoning packet according to package directions. 3. While rice is cooking, melt butter in a large saucepan. Add onion and cook over low heat until tender. Stir in flour, salt and pepper. 5. Stir in chicken, pimiento, parsley, almonds and cooked rice. Pour into a greased 2-quart casserole dish. 6. Bake uncovered for 30 minutes. Top with toasted panko breadcrumbs.